Proteins are molecular machines inside living cells which carry out tasks from chemical synthesis to cellular motion. Each protein is a linear polymers made of units that each are one of twenty amino acids, A(1) to A(20), for example from a sequence A(5) - A(12) - A(1) - A(5) - ... - A(17). Random sequences lead to disordered, non-functional proteins. A central feature of life is that evolution has given rise to protein sequences which fold into functional proteins. The process through which the disordered linear polymer folds into its final structure, however, remains mysterious, since it is very difficult to observe experimentally. 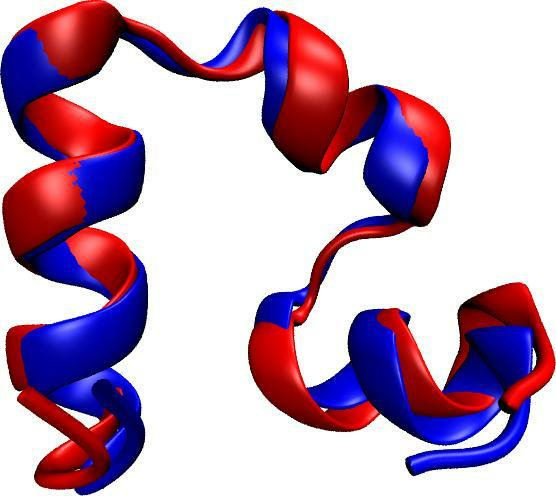 Unfortunately, simulations of protein folding are very computationally demanding and have uncertain outcomes (see the May 2009 highlight), which has historically limited their utility. Now, researchers have usedNAMD to simulate the complete folding process of a small protein, villin headpiece, as reported recently. In a series of atomic resolution molecular dynamics simulations, covering a total of 50 microseconds, multiple folding events were observed. Importantly, the simulations provided a glimpse at the prevalent intermediate conformations visited by villin during folding. A key transition between two intermediates was recognized as rate-limiting in the villin folding process. More information is available at our protein folding website.